When we sold our first home to buy our current one, we did the opposite of what a lot of growing families do: we downsized. 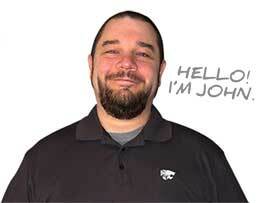 Our first home was a modest 1,900 square feet, but it was still too big for the two of us. The house had 4 bedrooms, 2 bathrooms, and a full basement and attic, with full living quarters on the second floor. Because we didn’t need the extra space upstairs, we kept that area closed off so that we didn’t have to heat or cool it. It basically became a glorified storage area, which only encouraged us to buy and store more furniture and stuff. Why Pay for What You Don’t Need? We decided we didn’t want to pay for wasted space. We didn’t like the payment on a house that was bigger than we needed, and we didn’t like the utility bills that accompanied it. We decided to sell it, even though our family had grown to include a new baby, and we downsized to a smaller, more economical home, which was marketed as a starter home. It was a smaller home with no fancy finishes, but we could put our own stamp on it to make it ours. Downsizing to a starter home quickly became the best decision we’ve ever made. “This 3 bedroom, 2 bath starter home with 1,500 square feet is perfect for the first time home buyer,” read the listing of our house when we first read about it. Sounds pretty typical, right? 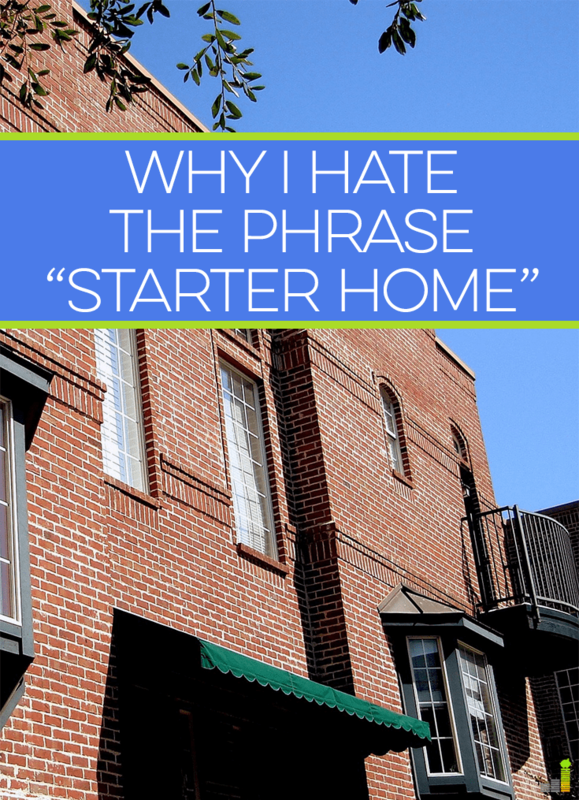 It’s not uncommon to hear the phrase “starter home” in any real estate conversation, but it’s a phrase I’ve long despised because of what it implies. The phrase “starter home” frustrates me because the meaning behind it is arrogant, as though no seasoned buyer with a little money in their pocket would possibly want to purchase a starter home because they would instead rather purchase a much larger home with all the fancy finishes that money can buy. What kind of message are we sending here? Bigger is always better? Is a 1,500 square foot house not something you should feel satisfied with if you can “afford” to finance a 4,000 square foot house in a fancier neighborhood? Should you always retain a goal of one day moving into something “bigger and better” instead of being satisfied with where you are? My mom and dad’s house is what would be called a starter home. It’s 1,400 square feet and my parents raised three children comfortably in that house, even though the bedrooms were small. When my brother and I were younger, we thought nothing of sharing a bedroom. In fact, it was fun! My mom has told me that at some points it was hard watching friends purchase bigger homes as they worked their way up the corporate ladder, while our family always stayed put. My parents were great with saving and budgeting and always valued family vacations and experiences together over nicer homes, cars, and furnishings, so they chose to keep our affordable home. Fast forward a few years when my parent’s factory laid off all of its workers to move the factory to Mexico, and my almost retirement-aged parents were relieved that they were 100 percent debt free, including their mortgage, while many of their co-workers were in rough shape financially. 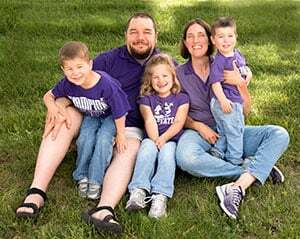 Not trying to keep up with the Joneses and choosing instead to have a “starter home” all those years had paid off for them, and now that their kids were grown and moved out, they had all the space they needed (and then some). As a child, I never knew how small it was because it was a happy and loving home. The house was not perfect, but it holds so many wonderful memories for my family, and I’m so glad my mom still lives in it to this day. I’m also thankful that my parents’ financial values rubbed off on me. Today, my husband and I are in the same boat as my parents, in part due to their good example. We have a small (starter) home, but we love where we live and our family is happy here. Part of that is because we own fewer things in a small house in the country, and our lives have been simplified. The other part is that we feel like we are financially free because our mortgage payment is so small. Now we even feel like the 1,500 square foot house is too big for us and dream of one day living in a tiny home or a little farmhouse in the middle of the country. How do you define a ‘starter home’? Do you feel pressure to buy a new or bigger home when friends, co-workers and family around you do? How do you decide what’s ‘enough’ or the ‘right’ home for you? 1500 Square Feet a starter home? Wow. We just bought an 1100 Square Foot home. You know what we call it? Our forever home. “Starter Home” is a consumerism term design to make people spend more money on things they don’t need. Like you said, the more room you have, the more useless junk you’ll fill it with. Great article, I agree 100% with everything you said. You are so right– the phrase is a consumerism term. 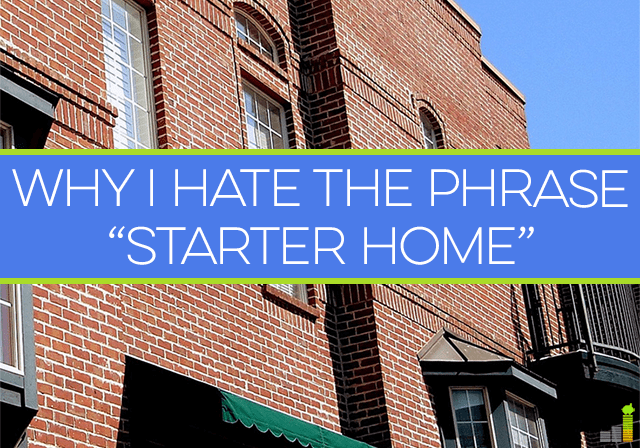 I hate the phrase starter home as well. While my wife and I aren’t sure this is the last place we will ever live, we never saw it as a short-term 5-7 year starter home. It is amazing seeing how quickly people will buy and sell homes to upgrade. You can classify our neighborhood as a “starter home” neighborhood because of the size and decenty affordability. Since we moved in 4 years ago, I estimate at least 50-60% of our street has turned over with many only upgrading their homes. It is a lot more expensive to only live in a home for a few years. Wow, that’s a huge turnover rate. We are in the same kind of neighborhood and have no immediate plans to move. It’s amazing how a label can sway someone’s opinion about a house. Ours is probably too big. Maybe someday we can downsize to a starter home! And that’s all it is is a label! Every time I see that a realtor has used that phrase, I just roll my eyes. The real estate industry has done a great job in making “starter home” an accepted thing in this country. It not only gets people into the housing market, but it also plants the seed that this house is only temporary and you need something bigger and better. I say, don’t make your home be a sign of wealth. Buy what you need, not what others say you should buy. Exactly– it plants a seed that the house is just a stepping stone to something bigger that you should own down the line. I think my parents are still in their “starter home.” They have lived there for more than 35 years! And at this point, it’s the right size for them again. I love real estate and would love to upsize, but I know in my heart this house is big enough for us. I love that my mom is still in hers as well. It fits her perfectly now that her kids are all gone. She’d feel lost in a bigger home. Ugh, I sooo agree! When we bought our first home, even though we knew we wouldn’t live there for more than 5 years (we’re still in it, FYI), we chose to look for investment properties that would rent well after we left, and that we could get for a steal. Sure enough, it worked! We bought our house for $46,000, and two weeks ago it appraised for $87,000. It is also too big for the 3 of us, with 1,500 finished square feet + another $1,500 almost finished in the basement, so we’re looking to downsize too. Love this! You guys got a steal! That’s awesome. Wonderful lesson here, Robin. Our society is so hell-bent on getting everyone to buy, buy, buy. Bigger, better is the message, but true happiness comes from other things. I couldn’t agree more, Laurie. A great example of consumerism and keeping up with the Joneses. Many people think they need a lot more room than they really need. I’m sure the term “starter home” was concocted by the real estate industry, who has a vested interest to always have us thinking about getting bigger and better. Moving up to a pricier home means more commission for them! That’s true, though I know there are still plenty of good realtors out there who don’t encourage their buyers just to buy bigger for a bigger commission. i just bought a “starter home” on Monday. It’s actually quite large (2000 square feet), but is dated. The price tag was literally half of what I qualified for, and as long as I live in this area, I will have no reason to upgrade. I get to remodel the kitchen to my tastes and it needs to be updated badly so I’m not feeling as bad about gutting the kitchen. It’s a single story so I’ll never get to that place where I need to move because I can’t or don’t want to do stairs. If my mom ever needs to move in, this house works. I drive by McMansions almost daily and for a minute I think about how nice it would be to live in a house like that. And then my frugal (and smart – ha) side kicks in and immediately scoffs and says what a waste. I’m excited to be able to live in a place for a whopping $1480 a month (escrows included) and pay off my student loans. It’s already less than rent plus pet expenses and I also have a roommate to more than split the costs. Winning! Congrats! Sounds like you’ve got a great plan with your new house. I 100% agree with you, Robin. We are currently renting out our 890 square foot starter home, and I miss it like crazy. The house we are renting for the next few years is really much too big for us, but it will be fine until we can start building our perfect smaller, forever home. You read my mind and actually beat me to writing this post! I think the term itself is offensive. There are many people who will only ever own a “starter” home. Think of the people who work 20, 30 years at jobs that don’t pay all that much. They may spend decades saving for their first home, and their “starter” home may really be a dream come true. It’s offensive to call it a “starter” home. Kind of a different approach to the topic than you gave, but I think we are on the same page with this. I agree that it’s offensive. Arrogant, really. My mom stayed in her “starter home,” and has been mortgage free for years because of it. I’d rather her be mortgage free than still saddled with a mortgage payment for more house than she needs. I still live in my “starter home”. It’s 970 square feet and I’ve raised four children in it. With only 3 bedrooms, there were two kids to a (smallish)room. Not a big deal because we hardly spend any time in our rooms really. Now my oldest is out of the house and her sister has the room to herself. She’ll be moving out next year and then the two younger kids will have a room to themselves. One day those rooms will be a guest room and a sewing room. The mortgage is only $445/month. Talk about affordable. We love our home and it has grown with us. That’s awesome! I laughed because when I moved out, my mom turned my old room into a sewing room as well. She loves it! I joke to her that she couldn’t wait to get me out so that she could get her sewing room! YESSSS this post is excellent! One you read and think “I always felt this way but never actually articulated it this way” (or at least that’s how I’m thinking!). Love this post. Things like this always make me wonder how much of this is shaped by what you are used to as well. Reading US blogs I’m always amazed at the house sizes and prices! I’m in Amsterdam (NL) and live in a 250 sqfoot apartment, which is my second home. It’s a step up from the 200 sqfoot one I had before. Starter homes here range at about 165-230 sq foot. Friends who get married and have kids move out of the city to afford a “family home”, and even then 400-500 sqfoot would be considered really nice!! I can’t even come up with any house I know that is the 1500 sqfoot you mentioned in the post. (to give you some reference: my apartment costs about 330K USD! Not really a starter price right? My previous smaller condo was sold for 270K.) So pricing size what we see as starter or “comfortable” differs so much depending on location/culture. Fascinating. Do you measure things in square feet in the Netherlands, or square meters? 200 square meters is 2152 square feet. I’m always irritated when I read in American Blogs about “small” houses. Our house has about 130 square meters, we live there with our 2 adults, 2 children, 2 cats and a lodger who rents 2 rooms. And we still have more room than other families I know. And since buying a house costs about +10% fees, we don’t swap houses. The house we buy is usually the house we die in. In Germany there is no word for “starter home”. A house has to be heated, the taxes increase linearly, and (the most important point for me): It has to be tidiet up and cleaned. When I look at the US from my point of view, it looks as if you have to much of everything. Giant homes, giant cars like oil costs nothing, giant consume. Just for reference, 130 square meters is about 1400 square feet. Thank you for this article. I am in the midst of buying my first home from my grandparents and I absolutely love this house. But due to its size, I’ve had people say that’s it’s a good ‘starter’ home and I don’t feel the same. I don’t like the term ‘starter home’ because of what you’ve stated in your article. I don’t need a big home. This one is cozy and full of good memories. Maybe I will grow old and die in this house, who knows. It may be small, but it’s cute and it makes me happy. Why do I need to refer to it as a starter home as if I need a larger house?